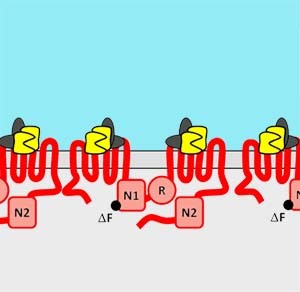 Connexins form gap junction channels that mediate intercellular communication by allowing the direct transfer of ions and small aqueous molecules between neighboring cells or by serving as hemichannels at the plasma membrane. There are >20 human connexin genes and one of the most ubiquitously expressed is connexin43 (Cx43). Several diseases have been linked to mutations in different connexin genes, including Cx43. Many of these mutant connexins are not efficiently processed and lack the ability to form functional gap junction channels. Determining how mutant connexins are mistargeted requires a more complete understanding of how normal connexins are processed by the cell. Prior to delivery to the plasma membrane and assembly into gap junction channels, connexins are first assembled into hexameric hemichannels. Most assembly of oligomeric transmembrane proteins occurs in the ER and is a prerequisite for further transport along the secretory pathway. 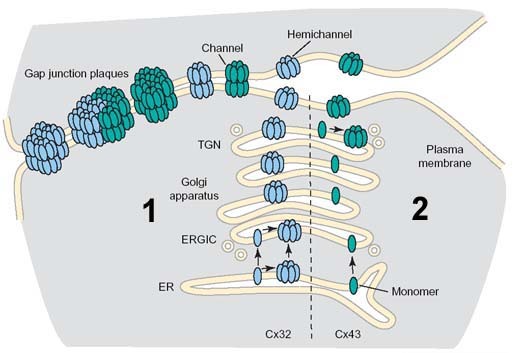 However, connexin hemichannel assembly appears to be more complex, since a number of intracellular compartments have been implicated in hemichannel assembly, including the endoplasmic reticulum (ER), ER-Golgi intermediate compartment (ERGIC) and trans Golgi network (TGN). Defining the intracellular compartments involved in connexin hemichannel assembly is further complicated by the existance of multiple connexin-specific trafficking pathways. Unlike most transmembrane protein complexes which are assembled in the endoplasmic reticulum, gap junction assembly begins in distinct intracellular compartments, depending on the connexin examined. For instance, Cx32 assembly occurs in the ER/ERGIC (Model 1). 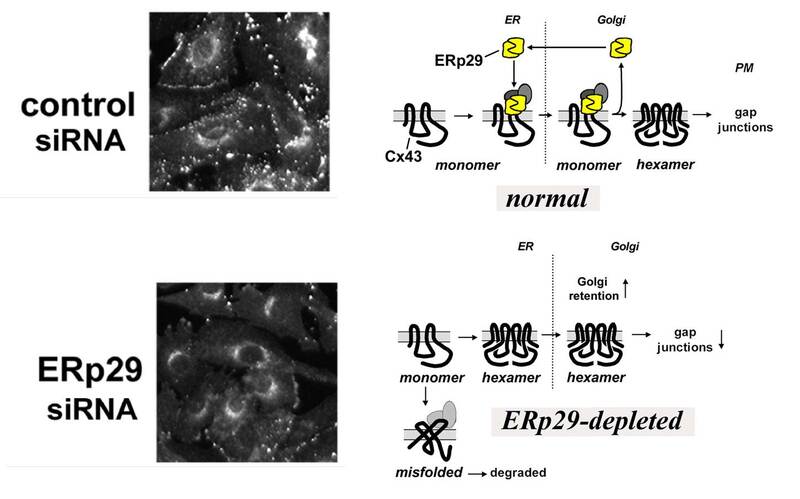 In contrast, Cx43 and Cx46 assembly occurs in the trans Golgi network (model 2). We have identified several steps in the quality control pathways which regulate assembly of connexins into intercellular channels. This includes identifying the first chaperone protein with the capacity to regulate connexin oligomerization, a thioredoxin fold protein known as ERp29. ERp29 specifically interacts with Cx43 and other related connexins, however, it does not bind to Cx32. This quality control pathway provides a mechanistic basis for the differential processing of Cx43 and Cx32. Moreover, this also implies that other client proteins which interact with ERp29 (including Cystic Fibrosis transmembrane conductance regulator (CFTR)) have the potential to influence the ERp29 pool and modulate Cx43 assembly and function. This is an active area of research in the lab. We are also applying these tools and approaches to study assembly and trafficking of tight junction proteins known as claudins. Claudins are tetraspan transmembrane proteins that form the physical basis for tight junction and thus are key regulators of epithelial and endothelial barrier function. Although both claudins and connexins have some similarities in primary and secondary structure, our preliminary work suggests that claudin assembly, trafficking and compatibility are regulated differently than connexins. Defining the mechanisms that regulate claudin assembly and turnover is another long term goal of the lab. We have designed ER-retained connexin chimeras which are differentially oligomerized in a connexin-dependent manner. ER-retained Cx43 chimeras are being used as "bait" for trapping, isolate and identify elements of the connexin quality control pathway in addition to ERp29. Identify how other client proteins which interact with ERp29 affect Cx43 activity. Determine whether ERp29 and other elements of connexin quality control regulate the trafficking and assembly of claudin-family tight junction proteins. Das Sarma, J., S. Das and M. Koval. 2006. Regulation of connexin43 oligomerization is saturable. Cell Commun. and Adhesion 12:237-247 (PubMed). Maza, J., J. Das Sarma and M. Koval. 2005. Defining a minimal motif required to prevent connexin oligomerization in the endoplasmic reticulum. J Biol Chem., 280:21115-21121 (PubMed).